Hey! It’s Lindi, from Love Create Celebrate. 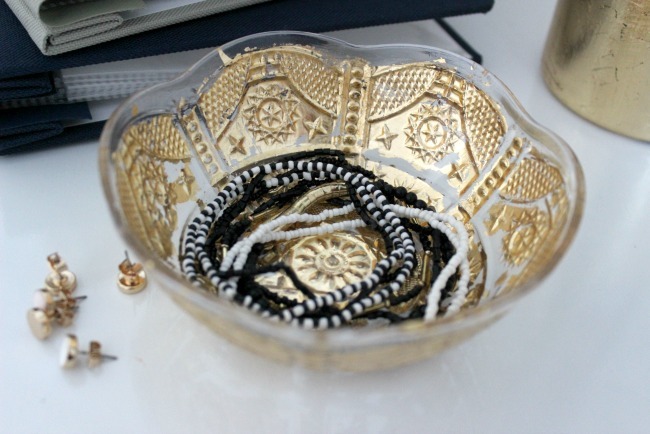 I’m back to share another great DIY tutorial with you! 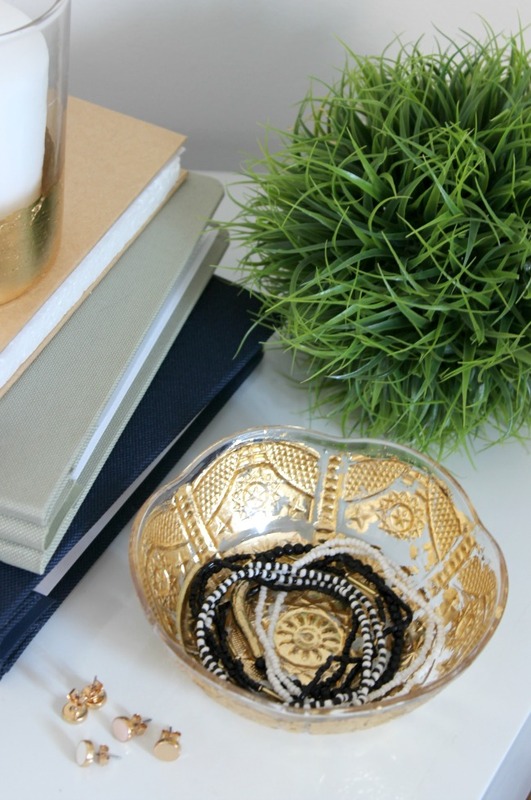 My home is filling up with beautiful gold decor and I made it with items from the dollar store! 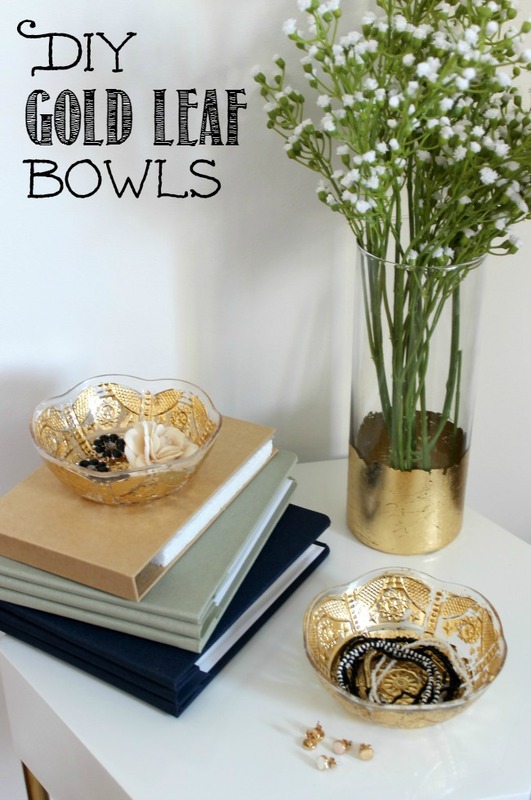 I can’t wait to share how I made these DIY gold leaf bowls with you. I LOVE these projects because they don’t cost very much, but they make a huge impact! 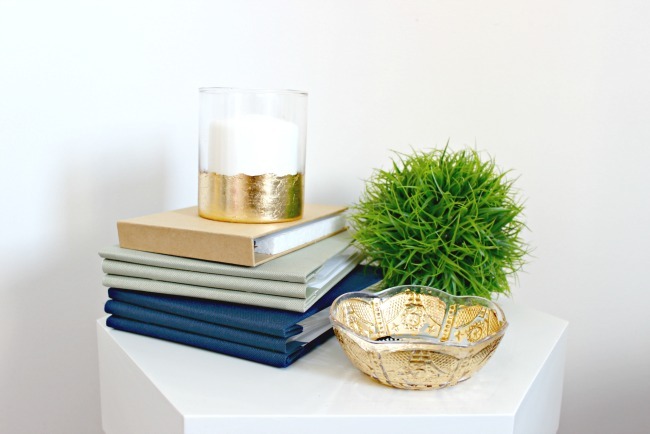 You can apply these techniques to any glass or plastic item in your home to get that beautiful metallic flare. 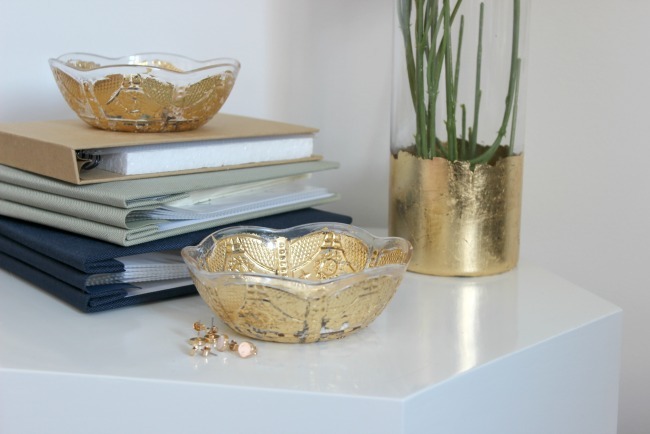 I’ve had these plastic bowls sitting in my kitchen cupboards for ages, so I decided to turn a couple of them into gold leaf accent pieces. The basic steps to complete this project are 1) add adhesive, 2) add gold leaf, 3) rub off excess gold leaf, and, 4) add sealer. I’m a visual learner, so I though that instead of explaining the whole tutorial to you, I’d share a video to show you the whole easy process! That’s all there is to it! If you have any questions or comments, I would love to hear them! Here is the finished project up close! Another reason I love them is because they can fit in perfectly no matter what season it is. 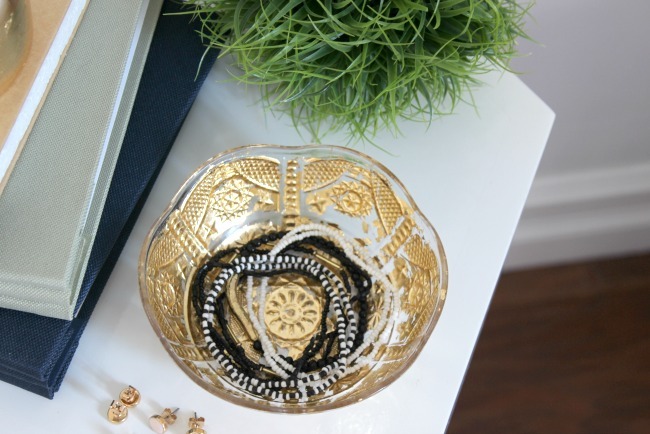 I filled my new bowls with some jewelry and placed them beside some faux greens to bring some spring decor into my home as the weather starts to warm up. I bet you haven’t had enough gold yet! 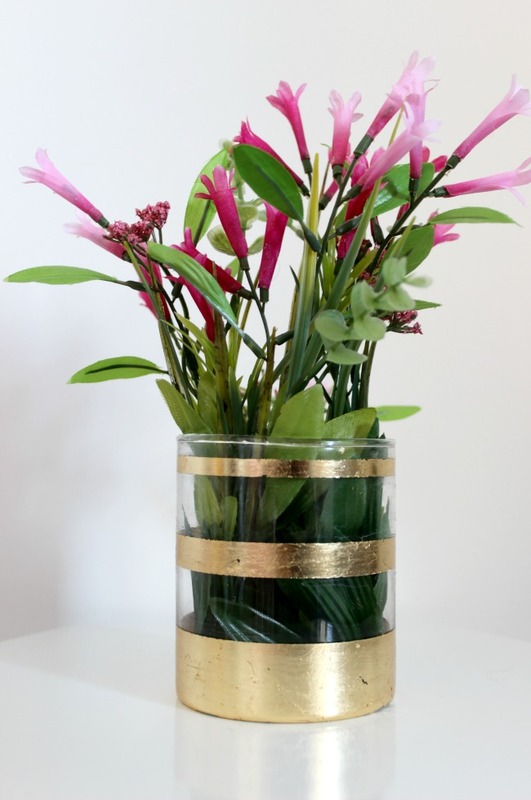 If you want to see how I made these modern gold striped vases, make sure to stop by Love Create Celebrate for that tutorial and find out how I made those perfectly straight lines. 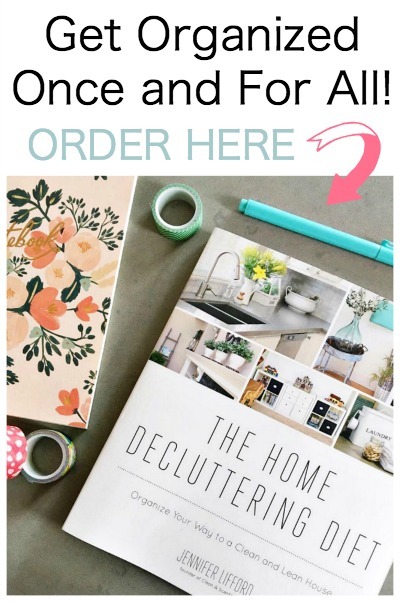 For more DIY home decor inspiration visit me at Love Create Celebrate. I’d LOVE to see you there! Or you can follow me on Pinterest, YouTube, or Facebook! These are beautiful, and it’s such an easy update! 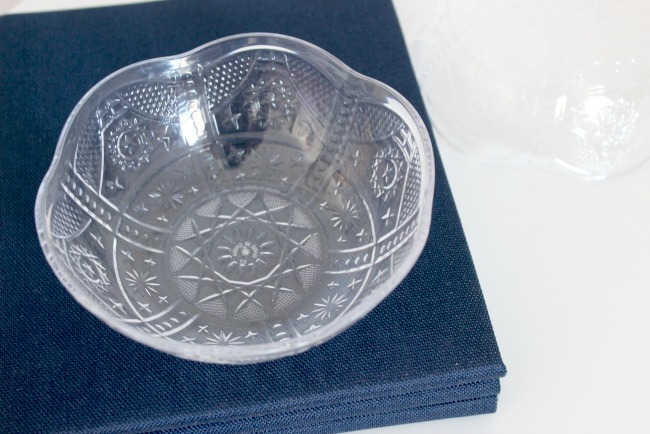 What a gorgeous project- I can’t wait to make one! Pinning! 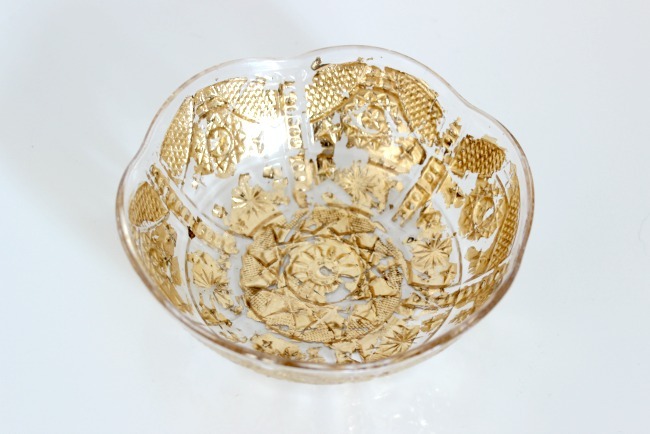 The gold leaf really makes the design in the bowl stand out. Very pretty and easy to do. Thanks for sharing your tutorial on Merry Monday. You come up with the cutest things! Love how simple these are to make and the gold- perfect for a bit of decor for St. Patrick’s Day! Thanks for sharing at #TalentedTuesday… I couldn’t help but to feature it today!